Today, individuals, families, businesses and nonprofits will come together to support Giving Tuesday, a national day celebrating generosity. It’s a day in which all can participate – either by giving financially or through volunteerism. In Los Angeles County, we found that a staggering 80 percent of residents said they are willing to increase their volunteerism and 65 percent would be willing to donate more money to build a better L.A. County, but are unsure about the opportunities out there. We invite you to join us in supporting the funds and organizations dedicated to improving the lives of L.A. residents. We hope these ideas will motivate you to give back. Want to give back to your community this holiday season, but not sure how? This is the time of year when people need help the most. 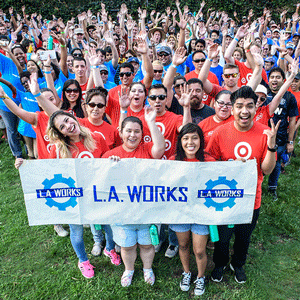 Here’s five tips from L.A. Works project leaders to make your volunteering experience worthwhile — for you and those receiving your generosity. Click here for a list of holiday volunteer opportunities in Los Angeles County. As part of Giving Tuesday, consider donating to the Future of L.A. Fund, one of the simplest ways to give to Los Angeles through the California Community Foundation. This fund allows you to make a gift and rely on CCF to make grants to organizations across the county with the greatest need, based on our expertise in the community. This is the first in a series of Giving Season posts to inspire generosity and positive change in Los Angeles County.